The most common signs of unbalanced tires are vibration and noise problems. When driving with an out-of-balance wheel, the wheel literally bounces down the road rather than spinning smoothly. This can affect the speed, handling and mileage of your car. Many of today’s cars have lightweight suspension systems and are therefore, more sensitive to imbalance than older cars. 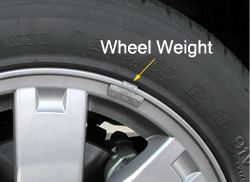 It’s a good idea to have your car’s wheels balanced when rotating the tires, about every 6,000 miles. It’s not uncommon for wheels to lose a wheel weight from time to time; so periodic balancing minimizes the impact of unbalanced wheels on your car.